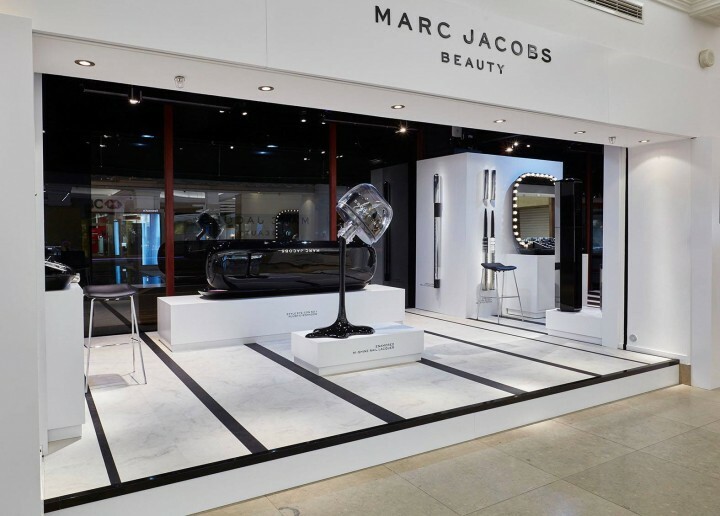 Marc Jacobs has a massive promotional space within Harrods, London, to promote their new beauty range. The design is playful and features oversized sculptures of the new collection, key products such as the Velvet Noir Major Volume Mascara and Le Marc Lip Crème in Charlotte - a Harrods exclusive. 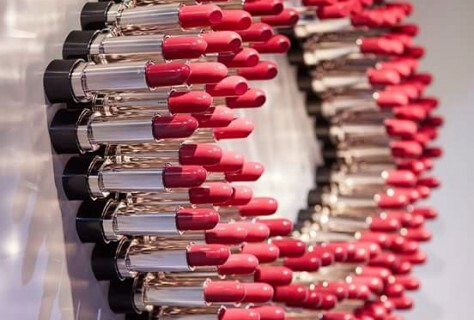 The display fills the front windows at the west end of the store which greets you with a giant Dali-style pair of lips which is made up entirely from glossy lipsticks. Along with this there is a rocket sized lipstick paired with a king-sized lip liner and enormous eyeliner, everything someone needs for that perfect make-over. As you can see from the images everything is hugely super-sized and really grabs the attention of passers-by. 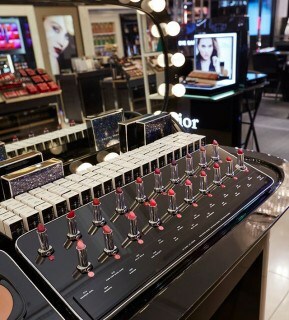 One key feature includes a monumental mascara which sits between two theatre-style make-up stations which both display the entire cosmetics range. 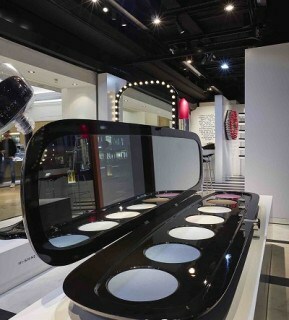 Elsewhere there is a nail varnish bottle being poured and a supersized eye-shadow palette that fills an entire store window, which includes a large mirror that makes people stop and look at their reflection, in result taking in the rest of the scene and the product on display. 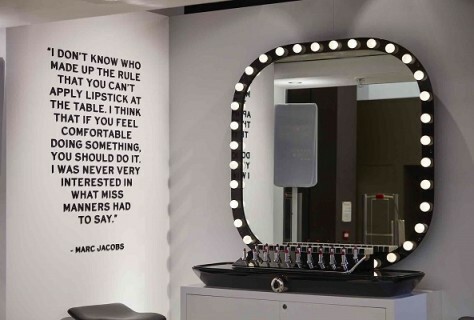 There is a great quote featured from Marc Jacobs himself which is by one of the theatre-style make-up stations as featured in one of the images. Digital screens are also used in the space to add to the experience with headphones available for customers to watch Marc Jacobs Himself discussing the story and inspiration behind the new collection, which creates a highly immersive experience for the customers. The space is decorated with Hollywood mirrors, black and white striped flooring and statues of Marc's beloved dog Neville which emphasises his luxurious make-up collection. His creativity is the key to his vision which is reflected within these pop-up windows. Marc Jacob's beauty collection consists of innovative complexion, colour cosmetics and luxurious make-up brushes creating timeless luxury with an unexpected twist. D4R LOVE THE NEW SELFRIDGES WINDOWS FOR THEIR WORK IT CAMPAIGN!